The majority of our projects are subject to strict confidentiality. However, in some cases, our clients have allowed us to share the results with the scientific community. You will find below examples of projects conducted at EDELRIS. The European Lead Factory (ELF) is a collaborative pan-European platform established to boost European drug discovery efforts. ELF’s 30 partners (large pharmaceutical companies, SMEs and Academic centers) work collaboratively towards building a 500,000-compound collection and associated biological screening facilities. In this 5-year program, academic researchers from prestigious Universities and European CRO SME’s have joined their efforts to assemble a new screening collection of 200,000 compounds based on innovative scaffolds. Together with our academic partners, Profs Nelson and Marsden from the University of Leeds and Profs Clausen and Nielsen from the Technical University of Denmark , Edelris has set up a robust and efficient platform now able to steadily deliver a yearly average of 10,000 molecules and has achieved the objective of 40,000 sp3 rich compounds over 5 years. On behalf of Bayer HealthCare, a chemistry Hit-to-Lead optimization program was conducted by Edelris against ATAD2. The epigenetic regulator ATAD2 has been proposed to play a key role in cancer control, however, further validation of the role of ATAD2 in different cancer indications was limited by the absence of selective, potent and cell active ATAD2 inhibitors. We conducted the optimization of several chemical series of ATAD2 bromodomain binders initially identified from DNA-encoded compound libraries. After a few rounds of potency and properties optimization, our efforts resulted in the identification of BAY-850, a potent and cell active isoform-selective ATAD2 chemical probe showing unprecedented chemical structure and mode of action. The work carried out by EDELRIS has improved the affinity, selectivity and diffusion in tissues. This case study, conducted on behalf of Galderma, aimed to identify novel inhibitors for the target Caspase-1. This enzyme is involved in various inflammatory diseases such as rheumatoid arthritis, osteoarthritis, or psoriasis. Our drug design platform EDEN (Edelris Discovery ENgine) has been used for this objective, relying upon our proprietary database of natural product inspired fragments (Keymical Space™, 153,000 fragments). 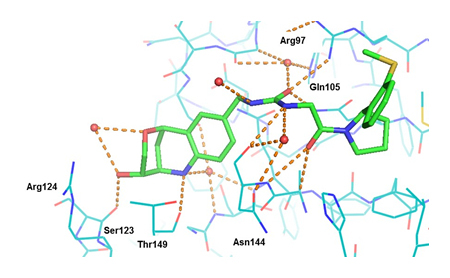 A scaffold hopping strategy was envisioned for scaffold replacement solutions using available structural information (X-ray structures of known inhibitors in complex with Caspase-1). Peptidyl-prolyl isomerases (Cyclophilins) are extremely challenging targets. Although the druggability of this target class has been partly demonstrated in the 90s with Cyclosporin A (CsA), HTS campaigns failed to deliver valuable hits to identify small molecule inhibitors. Original, 3D-fragment hits from the Edelris Keymical Fragments™ collection were identified by EMD Serono using a fragment-based screening strategy. The fragment optimization program (FBLD) developed as a joint collaboration led to low molecular weight nanomolar inhibitors in two to three optimization cycles.